Though the starting-point might be parity between a euro and a drachma, the new currency would quickly depreciate. Estimates from the IMF in 2012 suggested that it would fall against the euro by 50%. Such a reduction could spur an eventual economic revival by making Greece more competitive. After Argentina severed its decade-long link with the dollar in 2002, it experienced several years of rapid growth, helped admittedly by a commodity-price boom that played to its strengths as an agricultural exporter. The hope would be that Greece could also exploit its improved competitiveness, especially by attracting more tourists. Even so, there would be several drawbacks. Grexit would be a huge short-term shock to the economy. Reintroducing new notes and coins would take several months. This would be likely to create chaos, even though ever more people are making payments electronically. In all likelihood, Greece would have to leave the EU as well, which would cut it off from the bloc’s single market (and regional financial assistance). Inflation would surge as soaring import prices rippled through the economy; the IMF’s analysis in 2012 suggested that Greek domestic prices would rise by 35%. The uncertainties caused by Grexit would undermine both consumer and business confidence. All of which makes an Argentina-style boom highly unlikely. The economy would probably be pushed back into recession, only a year after it had started to recover. The IMF estimated that Grexit would cause an already sliding economy to contract by an additional eight percentage points in 2012. The uncertainties would persist as the Greek government found itself stuck in an Argentine-style legal imbroglio, making it impossible to borrow from abroad. Although the Greek government could redenominate domestic debt it could not do so for foreign debt. That burden, still in euros, would grow dramatically overnight in relation to the devalued drachma-based economy and the Greek tax base, which would make a fresh default unavoidable. Long legal battles would be inevitable, especially with private holders of the new Greek bonds issued in a restructuring in 2012, which were written under English law. 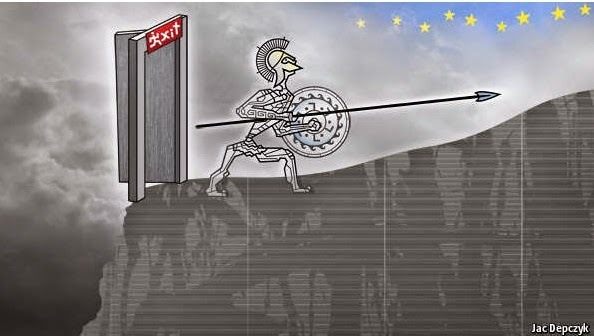 In some respects, Greece is better-placed now to cope with an exit than in 2012. According to the European Commission, the government ran a primary surplus (ie, before interest payments) of 2.7% of GDP in 2014, whereas two years earlier it was still heavily in deficit (3.6%). Greece’s once forbiddingly large current-account deficit (which reached 15% of GDP in 2008) is more or less back in balance. Grexit would therefore not cause a sudden budgetary crunch, and the balance of payments would be more resilient to the immediate effects of rising import prices and would gain from bigger exports. But Greece is also better placed than before to prosper within the euro zone. A sudden exit would set back a promising recovery. Following a savage recession, in which GDP shrank by 27% from its previous peak, the economy has been growing since the start of 2014. It is now much more competitive than before, following big falls in wage costs. The sheer size of Greek public debt, at 175% of GDP, is cause for concern. But in fact much of this is owed to other euro-zone countries, and these have provided hidden debt relief through extending maturities and charging minimally low interest rates. Interest payments have also been deferred for ten years on a big chunk of Greek debt. As a result, even though Greece’s stock of debt is now much higher than before the crisis, its interest payments are lower: 4% of GDP compared with 5% in 2008, when the debt was 109% of GDP. For the euro zone, the balance of benefits and costs is also unfavourable, though less so than in 2012. The gain for Greece’s creditors from Grexit would be one of discipline. A departure would show that members of the currency club have to abide by its rules, sending a strong message to rebellious politicians elsewhere on the periphery to fall into line. The risk that Grexit might cause a wider break-up is lower than in 2012 thanks to various new defence mechanisms, including a permanent rescue fund and the readiness of the ECB to come to the aid of countries facing a buyers’ strike on their government bonds. Even so, Grexit would still be a shock. Its detrimental impact on an already weak economic recovery could cause GDP across the rest of the euro zone to be lower by 1.5% in 18 months’ time than it would otherwise have been, according to JPMorgan Chase, a bank. Grexit would shatter the principle that membership of the single currency is for ever. A sell-off in the bonds of other countries that might appear susceptible would naturally follow. The euro zone might now cope better with Grexit, but the cost of showing that the currency club can fracture would still outweigh the gain of enforcing discipline. Αναρτήθηκε από Unknown στις 11:04:00 μ.μ.